You’ve learned the basics of Python, but how do you take your skills to the next stage? Even if you know enough to be productive, there are a number of features that can take you to the next level in Python. Pro Python, Second Edition explores concepts and features normally left to experimentation, allowing you to be even more productive and creative. In addition to pure code concerns, Pro Python develops your programming techniques and approaches, which will help make you a better Python programmer. This book will improve not only your code but also your understanding and interaction with the many established Python communities. 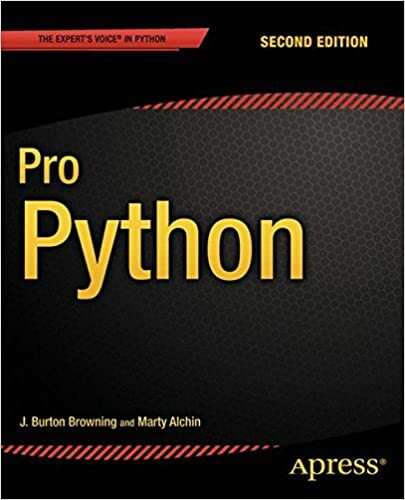 This book takes your Python knowledge and coding skills to the next level. It shows you how to write clean, innovative code that will be respected by your peers. With this book, make your code do more with introspection and meta-programming. And learn and later use the nuts and bolts of an application, tier-by-tier as a complex case study along the way. For more information, including a link to the source code referenced in the book, please visit http://propython.com/. This book is for intermediate to advanced Python programmers who are looking to understand how and why Python works the way it does and how they can take their code to the next level.